I'm wondering if this has come with age, or if it was always true. I am an introvert, which is strange, because if you knew me in real life, and some of you do, you might say I am an outgoing, gregarious person. And that's true too. But it does not come naturally. Recently, I read an article that asserted that there are four types of introverts: social, thinking, anxious, and restrained. I suspect that most introverts are a combination of the four, but if you identify as an introvert, take the quiz and see for yourself. I have come to embrace my introverted self because I finally understand her, and I suspect these five realizations are universal truths for many introverts. 1. My quiet time is sacred. It's not to avoid people, but merely to recharge my batteries. When I don't have access to alone time, even for a few minutes, my anxiety level rises and it's harder to be present and enjoy the moment. A few minutes alone allows me to recharge my own energy level and emerge ready for the next round of whatever is to come. If I don't get this recharging time, I find myself zoning out from the hyper stimulation, like a power saver mode on a phone. 2. When I was younger, I had a large circle of friends and an even larger circle of acquaintances. Now both circles are smaller, but tighter, and that suits me so much better. I feel like I can build deeper relationships with people as I really get to know them. And oddly, or not, many of my friends are extroverts. Yin and yan, I think. 3. Whether it is Attention Deficit Disorder, anxiety, introversion, or a combination of the three, over stimulation results in a processing nightmare. The person's voice with whom I am speaking becomes mottled in a Charlie Brown-ish teacher quality. My eyes dart around as I react to sound and image changes. It's not that I don't want to pay attention. It seems like I can't. I thrive on one-to-one and smaller group communication, where one person speaks at a time. It's not the real world in many cases, but for me, it's what works best. 4. I don't mind public speaking, but I am anxious if I have to make small talk. 5. I am hyper sensitive across all senses. This does not always manifest in a negative reaction, but it is something I have noticed and, as a result, I have accommodated my sensitivity in the way I cook and eat, dress, and interact with the world around me. Realizing that I am an introvert after all of these years has been a pleasant eye opener. I give myself time to take everything in and I recognize that, like language, everyone processes stimulation at different speeds. I can recognize when my energy is depleting and I am confident enough in myself to be able to recharge so I can enjoy more of what life has to offer. Are you an introvert or an extrovert? Do you know any introverts? How do you handle their quirks? most days I enjoy being a loner. I like being with others, but I enjoy my quiet, recharging time, for sure. My entire life I have been told that I am "extrovert" by close friends, but I know that like you said I am an introvert who falls under a different internal category. As much as I love to socialize and talk with new people, I prefer quiet time to recharge. I've always been surrounded by many acquaintances, but I am one of those people who can't develop close interpersonal relationships unless I am one on one with the person. Great read! I am a huge introvert and I totally need to check out that article on the 4 types! I get so overly stimulated in group settings, but I just need lots of alone time....but also some social! And I do like public speaking in a weird way too! This is exactly like me. exactly. I really resonate with your message here, Kelly. Thanks for your honesty to share it. I love people...but I have to have time off and quite time every week in order to spend so much time with people. Thanks for telling others this is important for some of us! I think I'm the same way, maybe that's why I work from home. I am definitely an introvert. I like quiet time. I have a very small group of friends now that I'm older and I'm fine with that. And I definitely have instances where people start sounding like the Charlie Brown teacher and I feel like I'm on overload! This post was very similar to how I feel most of the time. I think it is funny because I am always labeled as an extrovert, but I think it is because the rolls I always find myself in. I know that I am intorvert. I would typically categorize myself as an extroverted introvert. I need alone time to recharge. I don't like too much social stuff even if it's just me and one other person. Ah, there are more of us, I see. All I can say is "me, too." I've been processing this Extroverted-Introvert reality about myself lately, too. 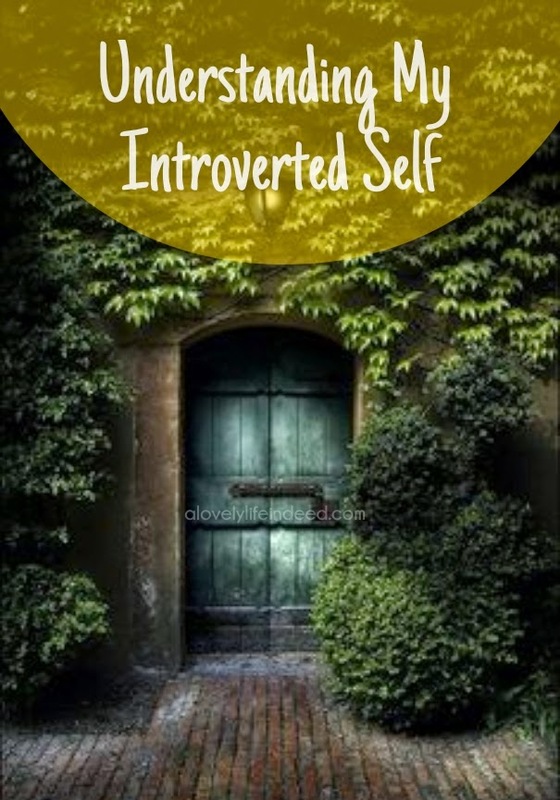 I feel like I have had a lot of "extroverted" expectations of myself (as several of my friends do) however, I know the introvert I grew up as--they don't necessarily. I have been trying to reframe my own expectations of myself because of the insight. Kelly, I can identify with this completely. Maybe it's just the place we come to realize is our true selves when we've lived long enough to appreciate it. Anyone who knew me even 10 years ago would probably say I was an extrovert. Always the life of the party, very outspoken (that may still be true) and always on the go. But now I embrace quiet time alone. I've learned to love myself without outside approval. I only wish I'd learned it sooner. Great post! I just wrote a bit about this -- proud to be an introvert like you. It's funny that you think people do not realize you are an introvert. I feel the same. Thanks for sharing this today! I need some kind of alone time during the day. It's how I can function to do the task at hand. Even if the Aline time is just 5 minutes. If not I do feel overwhelmed, even by the simple things in life. I don't think I could do public speaking, that most definitely gives me anxiety. I'm also an introvert but I am interested to see what the tests says! I have begun to think I am more introverted than I originally thought, because I am extremely social, but tend to get flustered and annoyed when I can't be in my own head. I am also extremelt sensitive to noises, smells, and lights. I'm very much an introvert, but I tried to force myself to be an extrovert for many years. Our society very much reinforces and rewards extroversion. We even tend to think that extroverts are more successful. It was after I read Quiet, by Susan Cain, that I really understood this. Since then, I have been much more comfortable, proud even, of my introversion. Thanks. Hi Kelly, I had to chuckle at this Post, mainly because I did one of these: are you an introvert or extrovert? fun tests last year, and ended up introverted in every single category of 25 but one. Like you, being a person known for much sociability, leadership, lots of friends and on... just like you... recently learning or reflecting this little tip on myself at this time in life ... funny thing is... I am sociable and like people... but I do need private space- access to time alone... When I talk to others I am solely interested and focused on them- provided they are giving me what I want to hear- that is, positively anything that is not small talk, well, we all can talk about the weather now and again. Though I can't say I'm sensitive to noises, sights, and smells beyond the average, perhaps this was the single category of the 25. In general, public speaking is OK. Go figure. Now, how do you suppose to get some 'alone time' after this Post, Good Lord, with all these comments perhaps maybe every blogger/writer on earth is an introvert! I am very much an introvert and while I love to interact with people at work I really need time at home to decompress. Reading at the end of the night helps me de-stress too. I think we all find strategies to help us recharge. Reading is a great way to do that. For me, I also like to come home and cook. I think writers, by nature, are introverts. It makes sense. But finding ways to recharge our batteries when we are feeling depleted is key. My most productive time is early morning, so here I am. :-) It sounds like we are very much alike. Having strategies to recharge is key. Some read, some cook, some workout...finding what you like is what's important. Have a wonderful weekend. Hi Anita! Thank you so much for your comment. I have Quiet on my iPad ready to go for my summer reading. I have learned to embrace my introversion. And why not? It makes me who I am, as it does so many of us. Thank you, again, for stopping by. I really appreciate it. Hi Tara, thank you so much for your comment. I think more of us are similar than different. I love that we can recognize and embrace it, rather than think there's something wrong because we're not extroverts. Cheers to us! Thanks again. Yes, please share. :-) Enjoy! Hi Melissa, I also feel overwhelmed when I don't get those moments to recharge. Self awareness and self care are so important. And why not? It makes us who we are. Cheers to us! It's funny how self awareness comes with age. I would have said the same about myself. I think more of us are similar than different. I love that we can recognize and embrace it. Cheers to us! Thanks for your comment, Barbara. :-) Have a great weekend. Thank you so much for your comment. I vote to let go of any expectation that pulls us from our authentic self. Embrace who we are. People who love us love us for who we are. Self awareness and self care are key. Cheers to us! There are, indeed, Carol. Cheers to us! We are all probably blends, as with our level of introversion. We all have strengths and weaknesses; the key is self awareness and strategies for self care. Know it, own it, embrace it. :-) And practice self care to protect and support that part of you. Embrace it. :-) Cheers to us! They do. The people that love us love us for who we are. Knowing those strategies for self care is key to protecting that part of us. I agree, Tracy...I think writers, by nature, are introverts. I think more of us are similar than different. I love that we can recognize and embrace it, rather than think there's something wrong because we're not extroverts. Cheers to us! Hi Jessica, I think more of us are similar than different. I love that we can recognize and embrace it, rather than think there's something wrong because we're not extroverts. Cheers to us! You're lucky to be able to do that, Holly. I suspect that there are more of us than people think. Cheers to the introverts! Thank you for your comment, Pam. I think there are many of us...more similar than different. We need to find what works for us; self care is critical. When we know better, we do better. People that love us love us for who we are. And we should too. :-) Have a great weekend! Thank you, again. Have fun with the quiz. Rebecca. Let me know what you get. :-) Like many of us, you may have a blend of all four types. Thank you, Andrea! I think more of us are similar than different. I love that we can recognize and embrace it, rather than think there's something wrong because we're not extroverts. The people who love us love us for who we are. Cheers to us! Thanks again. http://callthemidlife.com/flying-my-introvert-flag/ Thanks for your interest Kelly! I love your blog! I'm an extrovert, but this description fits my husband to a T. I appreciate the insights you've given, b/c it helps me to understand why he feels/does what he does without him (not) articulating it. Great share! We had to take a personality test last semester for my psychology class and I came out with the results 95% introvert. I've always know I am an introvert however social anxiety and anxiety in general has been a new thing for me since I've moved here last year. I am still trying to understand. Just like with you, people that know me and friends would absolutely agree I am the most bubbliest, outgoing, and social person ever. I think it comes with age or different life changes. All the things you mentioned is something I do. Except #4 both of those bother me. I can't do public speaking and small group conversations always make me feel awkward. I prefer the one on one. Self awareness is key, as is self care. When we know better, we do better, for others and for ourselves. Be gentle with yourself. So I'm not the only one!! I suspected this. I call myself a shy extrovert, but I think what we're saying is the same. I love to talk to my friends. Small talk at parties (especially with aquaintences as opposed to friends) is terrifying. Going new places makes me anxious.....and yet I can be so loud sometimes... Glad to meet you fellow introvert. No, you're not the only one. :-) I think there are more of us than not. So nice to meet you too. Please come back and visit again soon.